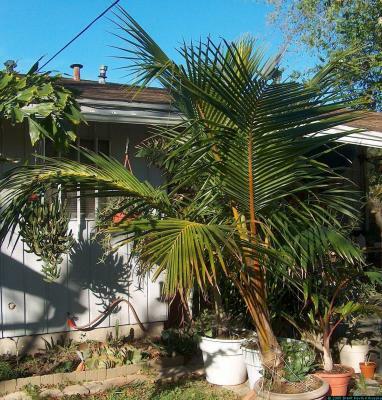 I'm a big fan of coconut palms as house plants. This one is about 9 years old. It's lived in full sun, full shade, and everything in between, and has never shown any sign of distress. Keep it moist. Don't feed it much unless you have a place outside to plant it. It was slightly leaf-damaged when it was a seedling by sub-40 degree (Fahrenheit) weather, but now it can takes temperatures down to the freezing point, although there can be some damage around the leaf edges. I *almost* lost it to 30 degree F weather. There's a UK gardening website that insists it needs full sun, but this one did quite well in a whole year in my tiny little apartment, putting out new leaves about once every two or three months, with only bad indirect light from an east window.